An investigation into the relationship between history, art, architecture, memory, and diplomacy. Between 1948 and 1956, the United States government planned an enormous project to build fourteen permanent overseas military cemeteries in Europe. These park-like burial grounds eventually would hold the graves of approximately 80,000 American soldiers and nurses who died during or immediately after World War II. Five of these cemeteries are located in France, more than any other nation: two in Normandy; one in Provence; and two in Lorraine. 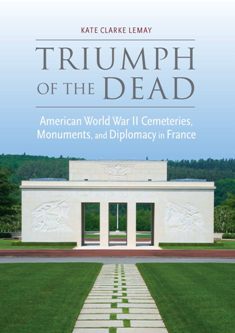 In Triumph of the Dead: American World War II Cemeteries, Monuments, and Diplomacy in France, Kate Clarke Lemay explores the relationship between art, architecture, war memory, and Franco-American relations. She addresses the many functions, both original and more recent, that the American war cemeteries have performed, such as: war memorials, diplomatic gestures, Cold War political statements, prompts for debate about Franco-American relations, and the nature of French identity itself. Located on or near former battlefields, the American war cemeteries are at once history lessons, sites of memory, and commemorative monuments. As places of mourning, war cemeteries are considerably different than civic cemeteries in their rituals, designs, and influences on collective memory. As transatlantic sites, the cemeteries both construct and sustain an American memory of World War II for a Francophile and European audience. The book features ten color photographs, fifty black and white photographs, and four maps. Scholars as well as enthusiasts of World War II history, mid-century art and architecture, and cultural diplomacy will be interested in reading this richly researched book, the first in-depth history of some of the most important sites of American World War II remembrance.